This was so good, we ate it two nights in a row. Admittedly, we did have pizza dough left over, as well as a surplus of artichokes but this really was worth cooking again. Unlike the artichokes we cooked when making salad, we didn’t parboil these but just sliced them finely on a mandoline and then fried them quickly over a high heat. This method worked much better, resulting in crispier artichokes which soaked up less oil. It also produced a much more concentrated, nutty flavour which worked very well with the sweet salami. A scrape of lemon zest provided a good balance on the first night with capers instead tonight. The lemon just edged it. We use Jamie Oliver’s pizza dough recipe which we’ve documented here, I experimented by adding a little more sugar (maybe another quarter tsp) and yeast (7g instead of 6g)this time which seemed to work well resulting in a crispy, light base. 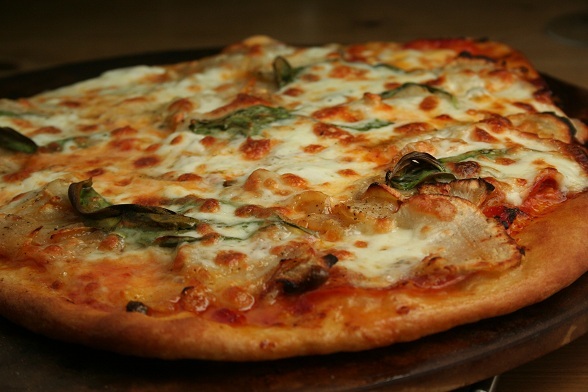 Subscribe to comments with RSS	or TrackBack to 'Pizza with Jerusalem Artichokes'. Looks excellent – must be good if you enjoyed it two nights in a row! I’ve never made my own pizza but your creations always tempt me to do so. Thanks Antonia. Give it a go – it took us a few tries to get the dough right but once we got it, it now works out well almost every time. 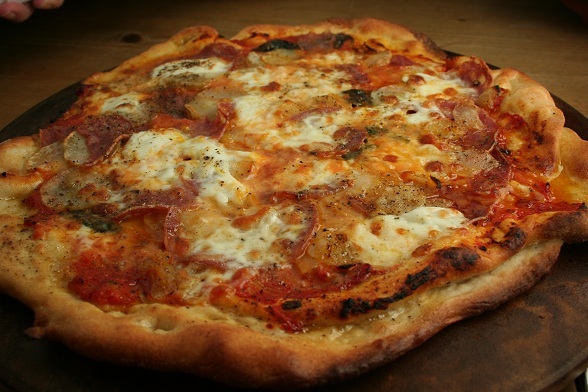 This pizza looks just fantastic and I am loving the simplicity of the toppings very Italian! Thanks, GC. It’s currently our second favourite pizza topping, after the cavolo nero and salami.